Ah, remember those days when we used to talk of the "paperless office"? It never really came true, did it? Even today, when you give a PowerPoint presentation, a lot of times you find yourself handing out a printed copy of the presentation slides so people can follow along. The only problem, and this is true whether you distribute printed copies or not, is that your audience never really gets a feel for where your presentation is going, and they need to wait until you actually pull up a slide and talk about it. A Table of Contents would help immensely, but there's no native support in PowerPoint for it, and if you make the brave attempt to create your own TOC, you find that it's hard to keep up, because you need to manually edit it every time you add, delete, or modify your slides. PowerTOC is here to bring joy into the lives of PowerPoint users everywhere. Using PowerTOC, you can automatically create an accurate Table of Contents for your PowerPoint presentations with a single click. Updating your presentation? No worries - just run PowerTOC again and have a fully updated Table of Contents ready to go in a flash! 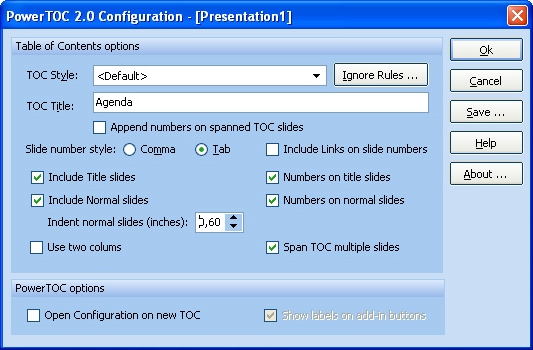 Your PowerTOC-driven Table of Contents is inserted right at the beginning of your presentation. PowerTOC is highly flexible, and you can customize how the application creates your Tables of Content. You can include or exclude Title slides, configure Tables of Content to span two columns, or more than one slide, and exclude specific slides from the TOC. When it's all set up to your liking, you can save the entire customized configuration and never have to tweak it again. Your presentations will be more effective than ever before, thanks to the wonderful summaries that you create with PowerTOC! Automatically create Tables of Content for your PowerPoint presentation. Relieve yourself of the burden of manually updating Table of Contents pages when your Powerpoint presentation changes. Customize the look and feel of your Table of Contents, and save your custom settings. Bring a new level of organization to your PowerPoint presentations. b g Website shows v3.0.2 at a price of US$49.95. Info above shows an unspecified version for US$29.95 but also says: "Download available for: Windows 95, 98, Me, NT, 2000, XP, 2003"
Will we be purchasing v3.0.2 for Windows 7, 8, 19? 64 bit? Manuel Onate Yes, the product is the current version v3.0.2. We are also finalizing the private beta for v3.1 which is compatible with 64 bit versions of PowerPoint. Jon Spain This looks really useful so I will buy in a moment. Could the platforms listed at the top of the page be updated to 7, 8 and 10, please (far more credible)? Further, could PowerMerge also be offered here real soon, please? Manuel Onate Thank you very much for your comments. I will try to modify the description. We are planning to offer a PowerMerge promotion in a couple of months, as soon as we finalize the next, much-improved version. Thomas User I am running PowerPoint 2016 64 bit.If I purchase, using this discount, will I be able to upgrade to the 16bit version when it is released? Manuel Onate Yes, as a registered user you will get access to the new version inmmediately. Manuel Onate Of course. As a registered user, you will get access to the beta version. Can the software be installed on two owned computer? Is transfer to a new computer allowed? If applicable, how transfer to a new computer accomplished is (e.g., automated deactivation or email request). Yes. It can be installed on two different computers, provided they are used by the same user. Thank you for your time spend responding to my questions. Sorry, I thought I answered your question before. Transfer is allowed, provided that the same person uses the same computer. The license is not locked to a system, so there is no need to deactivate the software. Thomas User Manuel - I purchased the 32bit version. Is the Beta available for the 64bit? I purchased the software a few minutes ago. Unfortunately, the license key in my confirmation email reads "Key: *** Server unavailable *** " and the download URL provided in the email returned the following page error "OOPS! Error 404 Page Not Found"
Your help in obtaining the license key will be appreciated. Chuck I have the same problem as Fredrick. Purchased, but no key or available download. Please address as soon as possible. Manuel Onate There are problems with our registration system, so we have had to manually generate the keys, There might have been some delays.